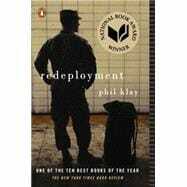 In "Redeployment", a soldier who has had to shoot dogs because they were eating human corpses must learn what it is like to return to domestic life in suburbia, surrounded by people "who have no idea where Fallujah is, where three members of your platoon died." In "After Action Report", a Lance Corporal seeks expiation for a killing he didn't commit, in order that his best friend will be unburdened. A Morturary Affairs Marine tells about his experiences collecting remainsof U.S. and Iraqi soldiers both. A chaplain sees his understanding of Christianity, and his ability to provide solace through religion, tested by the actions of a ferocious Colonel. And in the darkly comic "Money as a Weapons System", a young Foreign Service Officer is given the absurd task of helping Iraqis improve their lives by teaching them to play baseball. These stories reveal the intricate combination of monotony, bureaucracy, comradeship and violence that make up a soldier's daily life at war, and the isolation, remorse, and despair that can accompany a soldier's homecoming. Phil Klay is a Dartmouth grad and a veteran of the US Marine Corps. He served in Iraq during the Surge and subsequently received an MFA from Hunter College, where he studied with Colum McCann and Peter Carey, and worked as Richard Ford’s research assistant. His first published story, Redeployment”, appeared in Granta’s Summer 2011 issue. That story led to the sale of his collection of the same name, which was published in seven countries. His writing has also appeared in the New York Times, the New York Daily News, Tin House, and in The Best American Nonrequired Reading 2012.